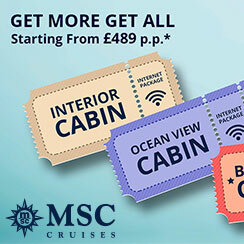 Get more for your money on the cruise of your dreams with MSC Cruises' latest promotion ‘Get More, Get All’. Explore destinations all around the World such as the Caribbean, Cuba, Mediterranean and the Emirates and receive additional benefits* on top of your cruise. Book before 30th September 2019* to take advantage of this great promotion. Pack your bags and explore the World with MSC Cruises! Book your blissful getaway and take advantage of our great last-minute offers. MSC Cruises has a fleet of ultra-modern cruise ships that sail all around the World. With prices as low as £399 per person experience our luxurious ships, carefully curated itineraries and have the most relaxing holiday taking in the beautiful ocean views with friends and family. 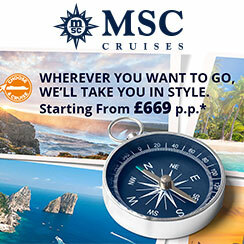 MSC Cruises offer one of the most modern fleets currently sailing the oceans of the world. The fleet currently consists of 12 ships, and each one is designed with an exquisite attention to detail. There are few other operators offering such high levels of interior beauty, few other ships which offer marble floors, contrasted by Swarovski crystals, walnut burl wood which sits alongside contemporary fittings. MSC provide one of the most elegant ways to visit some of the world's most beautiful destinations. It's these destinations which also help MSC to stand out from the crowd. Offering cruises through the Mediterranean all year round, visiting the Canary, Greek and Balearic Islands. Morocco, Spain, Italy, and Turkey. It's not just the Med that MSC serves, as they also cruise through Northern European waters, visiting the Fjords, Iceland, Cape North, and the Baltic Capitals. With MSC, it's less a case of 'where do you want to go? ', more 'when do you want to go?' Depending on the time of year, with MSC you can visit everywhere from the African continent, to the Caribbean, from South America to the Indian Ocean. It can be hard to find another company who offers so much variety. MSC strive to make it as easy as possible for their guest to join their ship. They even offer an online check-in service. Available 48 hours before departure, online check-in allows guests to embark quickly and efficiently, without the need to queue, allowing for more time onboard to relax and enjoy their holiday. As a family run company, MSC really understand and appreciate the importance of a family holiday, and reflect this across their entire fleet. With dedicated trained entertainers amongst the staff, specifically designed kid's meals, exclusive clubs and play areas, children aren't just allowed onboard - they're welcomed.